If you have a problem with an Etsy seller — specifically, you didn’t receive the item you ordered, or the item didn’t match its description — you can report the problem by lodging a case against that seller (although Etsy urges you to attempt to work out the problem directly with the seller first). While logged in to your Etsy account, hover your mouse pointer over the Your Account link that appears along the top of any Etsy page and click the Purchases link that appears. Hover your mouse pointer over the Report an Issue link; then choose I Did Not Receive an Item or An Item Does Not Match Its Description, depending on your situation. Don’t see a link? It could be that it’s too early — or too late — to file a case. If the seller specified a processing time, you can file a case up to 45 days after the Ships On date or after the order is marked as shipped. If no processing time was specified, you can file a case seven days after you placed the order, for up to 75 days. Etsy opens the case against the seller. To view the case, click the Your Account link that appears along the top of every Etsy page and then click the Cases link on the left side of the page. Click the link for the case to view details about the case. 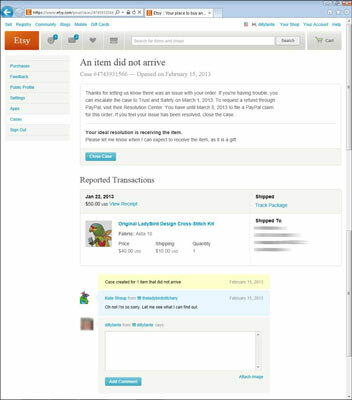 You can use the Add Comment box to communicate directly with the seller about the case — something Etsy suggests you do. 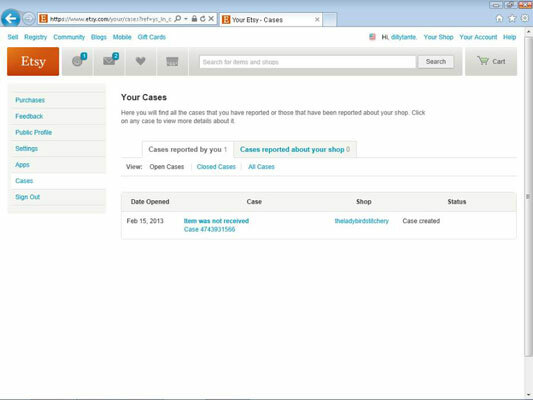 In addition, Etsy will communicate with the seller on your behalf by sending him a warning each week the case is open. If you and the seller come to an agreement that is amenable to you, you can close your case. To do so, simply click the Close Case button on the case’s page. Etsy asks you to confirm that you want to close the case; simply click the Submit button to proceed. When you do, both you and the seller will receive an e-mail confirming that the case is closed. If, after a certain period of time (seven days if you purchased the item via Direct Checkout; two weeks if you paid via a different method), the case remains unresolved, you have the option to escalate the case. Alternatively, you can wait for Etsy to escalate it for you, which happens automatically after two weeks (if you purchased the item via Direct Checkout) or three weeks (if you paid via a different method). When a case is escalated, it means that it Etsy’s Safety & Trust team will review it and take what actions it deems necessary. Although the Etsy Safety & Trust team can refund your money if you paid using Etsy’s Direct Checkout system, it can’t if you paid via, say, PayPal. In that case, you may want to contact PayPal directly for help.